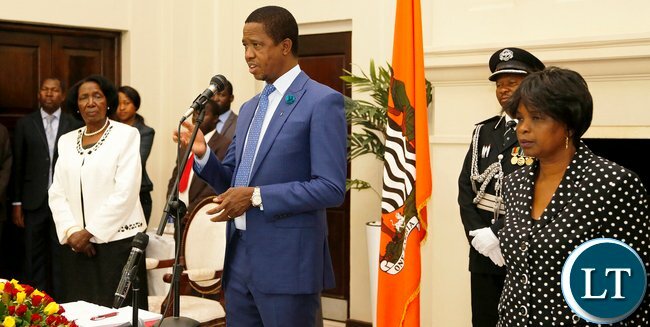 PRESIDENT Lungu is this week expected to commission the over US$153 million 381 km 330 kilovolts Pensulo-Kasama transmission line. Zesco spokesperson Henry Kapata said the project, which was executed through a loan facility from the Industrial Commercial Bank of China, has cost a total of US$153,826,305. Mr Kapata said in an interview yesterday that the contract between Zesco and EPC Contractor TBEA Company Limited of China was signed in September 2010, while the effective contract date was on November 27, 2012. He said prior to the commencement of the project, Luapula, Muchinga and Northern provinces were supplied with power through the existing 66kv transmission line. “However, as demand grew in these areas, the 66kv line could no longer sustain quality power supply. This resulted in the aforementioned provinces experiencing extremely low voltages,” Mr Kapata said. Mr Kapata said the project will increase the power transfer capacity and quality of supply to the three provinces and enhance energy-driven developmental projects. He said the multi-million dollar project is also aimed at increasing international capacity trading with the East Africa Power Pool and Southern Africa Power Pool under the African Union/NEPAD Trans Territorial Energy Infrastructure Development. Mr Kapata said another objective is to provide an enhanced and robust information communication technology (ICT) transmission corridor through the OPGW Optic Fiber cable that will enhance connectivity between the East African Community and Southern African Development Community and beyond. He said the project will also support expansion in the mining, agriculture, manufacturing and other sectors through the provision of reliable power supply. “It is worth noting that with the completion of this project, all the objectives have been realised and we look forward to witnessing the growth in economic and other developmental activities in the three provinces,” Mr Kapata said. And Mr Kapata has dismissed assertions by some online media publications that some deaths were recorded at University Teaching Hospital (UTH) as a result of the recent countrywide power disruption. Mr Kapata said contrary to the suggestions, UTH had successfully switched to its alternative power sources to sustain operations in critical sections of the country’s highest referral hospital. Meanwhile, President Lungu is tomorrow expected to launch what will be the biggest tree plantation in Zambia in Chief Mukwikile’s area in Shiwang’andu district, Muchinga Province. Special assistant to the President for press and public relations Amos Chanda confirmed the development in an interview yesterday. Mr Chanda said the launch of the plantation will create jobs to the locals and add to the culture of protecting the environment. Meanwhile, Muchinga Province Minister Mwimba Malama has said the plantation will boost the economy of the province. Just like the Constitution, FOUR YEARS OVERDUE! After putting Zambia into 8 BILLION KALOBA all these PF idi.ots have to show for it is the economy in reverse gear! ZESCO’S Chipata substation under construction in Msekera area. The project is scheduled for commissioning in May 2015. – Picture by DARLINGTON MWENDABAI. LUNDAZI and Chama in Eastern Province will cease depending on electricity supply from Malawi once the Pensulo-Msoro-Chipata west 330kv power transmission project is commissioned in May next year. Tebian Electric Apparatus Stock (TBEA) Limited, the contractor of the project said works on the project are progressing well and scheduled to be completed on time. Is there anything we build with our own money. .. $150million from the Chinese and I can bet you its also a Chinese contractor….with all these loans they practically own us!! so since this project was conceived by MMD, on that account alone, all trials the country is going through are not PF’s? i actually dont understand the thinking of some of our friends here. Any matter that is positive (or on the face of it, appears positive) is normally attributed to other people, but as soon as we talk grimey ..its all PF…examples ..Power deficit…PF problem…Road project …MMD project…exchange rate fall…PF…Various groundbreaking ceremonies..MMD. lets be factual people…ya digg! lets be factual people…..ya digg!